Today’s article is a Bootstrap tutorial where we’ll learn how to easily create a Modal video, also known as “Pop-up video”. I’ll explain step by step and with the use of code examples how to make this video appear when the user clicks on a specific button or link inside our web page. As usual, in the end you can preview and download all the code as a handy template to modify as you like. A Modal or popup video can be used when you want to show a video to your users after a certain event happens, like the click of a link or button. 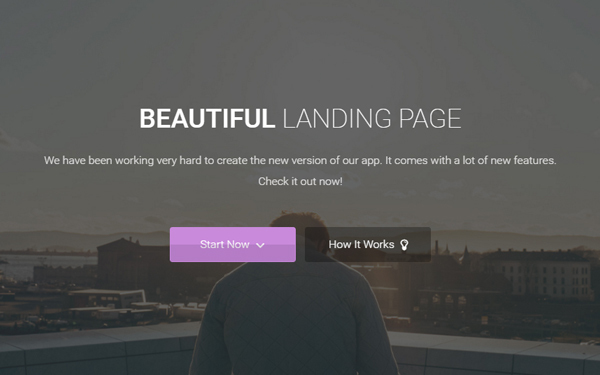 You can use a video, for example, in a landing page to show how your application, product or service works. Technically speaking, Bootstrap Modal is a jQuery plugin (so we need jQuery) included in the Bootstrap files that we have imported in our project. This is the case when we have imported the standard version of the Bootstrap framework and not customized it, like in this tutorial. If, for a specific reason, you need to import a customized version of Bootstrap in your project, remember to also include Modals. So, in a few words Modals are some simple dialog prompts / popup windows where we can put different types of content inside, like text, images, buttons, forms, etc. In this tutorial we’ll remove everything from the modal window and put inside only a “Close” button and a video, which can be embedded from sites like YouTube, Vimeo, etc. In our case we’ll take it from Vimeo. Ok, now that we learned what modals are and when to use them, let’s begin with the HTML code! If you take a look at the live preview from the link at the end of this tutorial, you’ll see that the demo page contains some additional elements such as a fullscreen background, some text and some social icons. 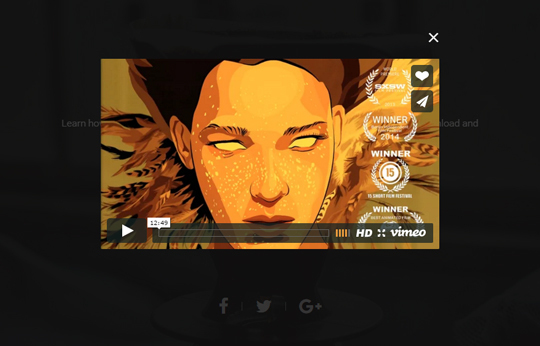 Also our main button, that will launch the modal video when clicked, has some additional styling. I’ve added these elements for esthetic purposes but they are not essential to this guide. So, I’ll not explain them here, I’ll just show their HTML code. If you’re curious you can download the code and check it by yourself. By the way, the icons come from Font Awesome that now is present in almost everyone of my projects. 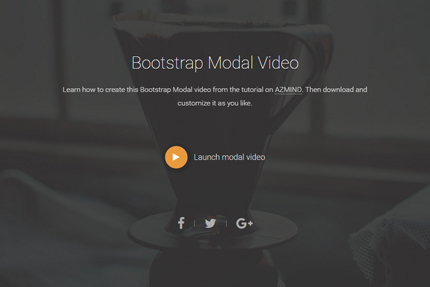 Learn how to create this Bootstrap Modal video from the tutorial on <a href="https://azmind.com">AZMIND</a>. Then download and customize it as you like. 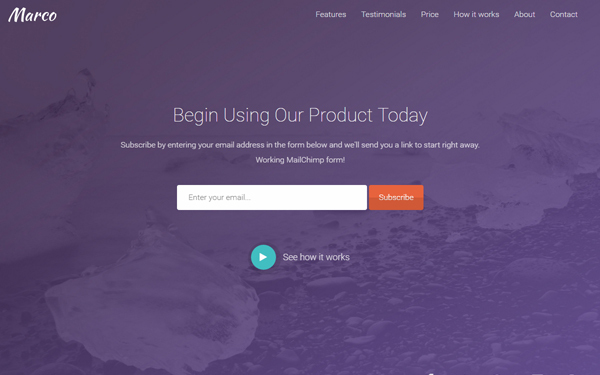 In the modal’s body we have added only the video, using Bootstrap’s responsive embed. The modal has the attribute “id” set to “modal-video”, the same value used for the attribute “data-modal-id” in the “Launch modal video” button. Also, for accessibility, we’ve used the attribute “aria-labelledby” set to “modal-video-label”. To see how are styled the other elements of the page, see the “style.css” file. That’s it! In this simple tutorial we just learned how to use Bootstrap modals to create a modal video, also called pop-up video or lightbox video. For any question or suggestions, let me know in the comments. Below you can find the live preview and download links. Looks great! However, the video keeps playing when the modal is closed. As was said above, the video should stop when the modal is closed. In order to stop the video playing when you close the modal, you can reload the iframe contents. now, when you click on close button, the video will stop to. 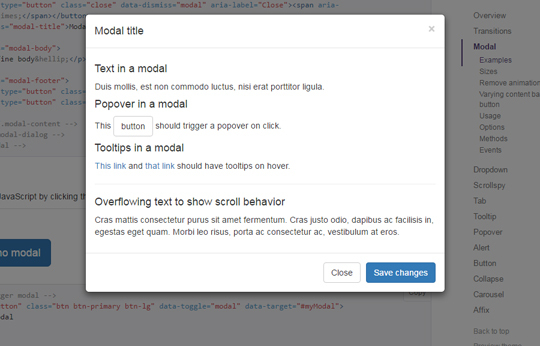 btw, in bootstrap modal, the modal close also when you click on the body, so you can add onclick=”pauseVid()” in the tag. What role does backstretch play for the modal? I tried to isolate the code just down to an anchor tag and the modal, so I could take just the necessary parts and install it into another page, but removing jquery.backstretch.min.js prevented the modal from opening. It’s all right with this, but I can’t display the Vimeo video on mobile devices. This does not work well with a simple url ending with mp4 format, ie. The mp4 pops out of the iframe and plays as a stand alone video. Vimeo and Youtube work correctly, however. So you may be wondering how to get any of those suggestions in the comments working (as I was) in order to have the iframe close/pause the video playing after the modal is closed. I tried every suggestion here to no avail. After tearing my hair out my brother helped me and I’m now posting the EASIEST WAY to get this to work properly for posterity and in hopes that the original author updates this tutorial so as not to infuriate others. It’s that simple. It works. You’re welcome! Thanks for this solution! Much appreciated. So how would you modify the solution to work with a html5 video tag instead of the iframe? Can you post the whole contents of your scripts.js? I am getting a js error. Hi Anli, Thanks for the great tutorial, it is not working with the new Bootstrap 4 beta version, can you please update this tutorial for bootstrap 4.
if I set the video source as “local video” it automatically starts when the page is loaded. Is it a way to avoid this? The solution from Jasper did not exactly work for me. I used trigger(‘pause’) instead. Below worked for me.